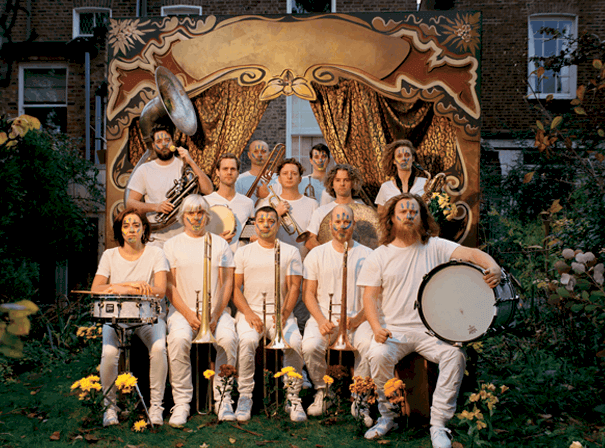 Hackney Colliery Band have become cult stars in the musical world having totally re-invented the brass band sound for the modern age. A truly brilliant live act who have enjoyed a remarkable few years, they have done everything from playing 45 minute sets at the Closing Ceremony of the London 2012 Olympics to appearing at the BRITs, MOBO Awards and Mercury Awards, as well as on many different BBC radio stations and Jazz FM. The band has fans all around the world, having played a number of gigs across Europe, and has worked with the likes of Amy Winehouse and Jamie Cullum. The group has great playing chops and a stage presence that makes every one of their shows both visually and musically compelling. They have a great sense of humour and can take their set from dynamic, to delicate, to powerful and punchy depending on the context. Their line up consists of trumpets, trombones, saxes, drummers and sousaphone, and they play everything from jazz to electronica thanks to their inclusion of drum machines and fantastic musical ear. Audiences of all ages and musical tastes can find something to love with this most celebrated of modern bands. In their time they have put out successful albums, such as their debut eponymous release in 2010, 2013’s Common Decency and a remix EP in 2014 that saw their sound reworked for the dance floor. Their acclaimed third album ‘Sharpener’ is out now, and rave reviews have helped them to sell out clubs across Europe.